In your home, the living room and the kitchen are the common areas where you go to be social with friends and family. The kitchen is where you cook and eat and the living room/den is typically where the television is, you can read and just relax each room has a purpose, right? Well, the living room/den kind of doubles as a relaxing room and entertainment room. Wouldn’t it be nice to have a room strictly for entertainment purposes? 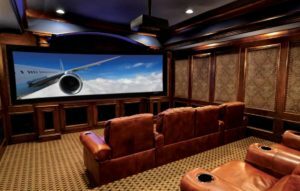 Of course, it would… just ask any owner of a “man cave” or “she-shed!” Fox News says there are several elements to a great entertainment room and it’s not just for the kids adults can have just as much fun, if not more. the essential item to an entertainment room is the media center. What’s the Big Deal About Having a Media Center? What’s the big deal? Having a media center in your home is quite a big deal! Want to know why? It’s because your media center is essentially an extension of your TV, but it enhances your television experience with functionality. For your entertainment room to truly be full of entertainment, you need to figure out everything you really need. Most entertainment rooms have an area for gaming, media center for TV/movies/music, and then some area for traditional games like pool or darts. You essentially want to build your entertainment room in a way that you’ll be able to get the most out of your entertainment. For example, certain versions of Play stations can play CDs, so there will be no real need for you to buy a cd player, you know? The goal is to make your entertainment room comfortable and functional, but definitely, clutter-free from unnecessary items. The evolution of TV has come a very long way, but whatever your television needs may be, you’re still going to want to view a good picture of it. Roku and Amazon Firestick are the most common types of wireless media devices. These allow you to stream your favorite shows and have really become the reason why a lot of people get rid of cable. If you don’t care for those, you can use Apple TV. Doing this gives you the most flexibility and allows you to build it exactly how you want but it can be quite difficult and expensive. Think of it like this, the more you spend, the more custom your entertainment experience will be. Gaming Area: PC or Console Player? Or Both? If you’re an avid gamer, then you probably media devices already. Xbox One X and PS4 have long since been known to a multitude of streaming services. Whether you want to play games, watch streaming services, or pop in a DVD or Blu-ray, you can do all those things with these consoles. All of this can be done from the comfort of your couch too! Now, if you’re a PC gamer, you’re going to have a slightly different setup for this particular gaming area. To properly play PC games will depend on what type of game you play and if you’re using a desktop or laptop. If you have a laptop, you can pretty much take that anywhere you go, but if you’re a desktop gamer, then you will need a few essential items to contribute to the entertainment room. It’s always nice to have the media center and your gaming area, but sometimes you just want to take your entertainment back to simpler times. There’s nothing wrong with incorporating a little modern entertainment with vintage entertainment. Pool tables, dart boards, and air hockey tables are the ultimate in “kicking it old school.” Its the perfect setup to talk trash to your friends and really just have a good time. If you have the abilities to incorporate one of these in your entertainment room, do it! It’ll really be worth it.